We talk so much about nonfiction these days. What does common core mean for nonfiction? What can we do to make nonfiction and common core mesh with our larger readers’ advisory goals? Where is nonfiction headed, especially the relatively new subgenre of nonfiction for young adults? How can we connect nonfiction with the right readers? And even more than that: how can we encourage more readers to discover they may just be the right readers for nonfiction even if they don’t know it? These are great and important questions to ask. But I don’t want us to lose sight of the heart of nonfiction. A great true story, told well and with passion and attention to craft, can change and challenge readers in the same way any fictional tale can. Steve Sheinkin’s latest book, The Port Chicago 50, is that kind of true story and that kind of nonfiction. The Port Chicago 50 is the true story of 50 American sailors who were tried and found guilty of mutiny even though they had never been out to sea. Moreover, it is the story of the courage of these men, still convicted mutineers to this day, who refused to buckle under the prejudice of the American military and stood up for their humanity, safety, and civil rights. I am guessing that most Americans are not familiar with the story of the Port Chicago 50 and I’m even more sure that most students have never heard of this unforgettable incident in American history. And yet it is exactly the kind of historical moment perfect for discussion and exploration with middle and high school readers. Sheinkin knows that and has crafted a book that encourages not only this interaction but keeps teen readers engaged in the story as they wrestle with the questions of what they might do if they were in the same situation. Sheinkin’s book is a thought-provoking introduction to what happened at Port Chicago, a California Navy base, in 1944. In the wake of a massive explosion that cost the lives of more than 300 sailors, most of them African-Americans serving in segregated and untrained units, a group of sailors refused to return to the dangerous jobs they had never been properly trained for that had caused the explosion in the first place. This act of protest was considered mutiny and 50 of these sailors were tried for this serious crime simply because they refused to be treated as lesser-than members of the Armed Forces. The brilliance of The Port Chicago 50 is the way Sheinkin uses primary source material to make readers feel completely immersed in the story. Of course, this is a hallmark of Sheinkin’s work and it’s just as compelling here. From trial transcripts to military documents, these sources make this story both thrilling and tense - which means it’s very readable. If you have readers who struggle to connect with fantasy or dystopias because they just don’t feel “real” enough - nonfiction like The Port Chicago 50 is an awesome alternative to try. The Port Chicago 50 particularly benefits from the interviews with the convicted sailors, many of whom are still alive and, unbelievably, still forced to fight to clear their names. Hearing their stories is both eye-opening and frustrating and inspiring. Imagine the classroom discussions you could have about this book! Imagine the booktalks! Can disobeying a direct order, even in the military, ever be the right thing to do? What would you risk for something you believe is right? What if the consequences you faced were possible execution? These are real questions raised by and faced by the people in The Port Chicago 50 - and they are worth discussing with teens even today. 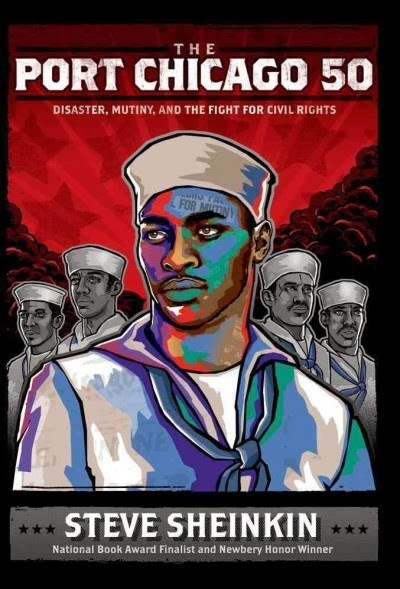 The Port Chicago 50 is ideal match for Black History Month booklists and displays but thanks to the impeccable research and stirring writing, it’s also an outstanding example of all current nonfiction for middle and high school students. I recommend this for 6th-11th grade readers. Try booktalking this one. Try engaging teens, the ones that love flipping through your magazines and won’t pick up a fiction book on a bet, about the risks and the moral challenges in The Port Chicago 50. This is a story you’ve never heard of but won’t ever forget. Since I grew up near Port Chicago, and who had only heard of the history of the explosion, this is intensely interesting to me, and I'm so glad someone wrote about it.